Florida Polytechnic University students Mc Ben Joe Charles (left) and Dominic Dodson (right) accompanied Dr. Sesha Srinivasan to the American Physical Society Bridge Program and National Mentoring Community Conference in California. 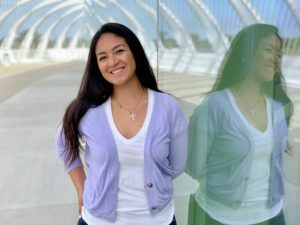 A Florida Polytechnic University contingent recently traveled to California to participate in the American Physical Society Bridge Program and National Mentoring Community (APS-BP-NMC) Conference. 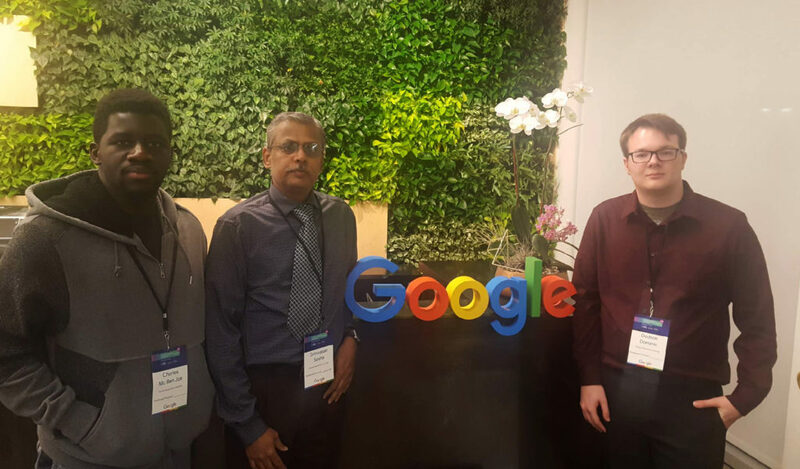 Dr. Sesha Srinivasan, assistant professor of physics, accompanied students Mc Ben Joe Charles and Dominic Dodson to the conference, which was hosted jointly by Google and Stanford University. 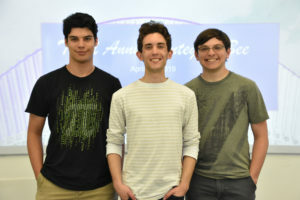 Charles, a junior from Orlando, Florida, and Dodson, a senior from Lakeland, Florida, presented research posters focusing on the ability of dolomites to store thermochemical energy and to capture carbon dioxide. Dolomite is a chemical compound made of calcium magnesium carbonates which is present in high concentrations in Central Florida’s phosphatic clay and pebbles. The students, who are both majoring in mechanical engineering, are working toward the feasibility of utilizing dolomite in a variety of applications, including at concentrated solar power plants and coal power stations. 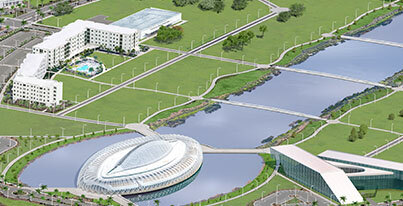 The research project is funded by the Florida Industrial Phosphate and Research (FIPR) Institute of Florida Polytechnic University. Charles, Dodson, and Srinivasan also took part in a variety of workshops that focused on diversity, industry, and effective mentor-mentee research. The APS-BP-NMC aims to increase the number of physics degrees earned by students from underrepresented racial or ethnic minority groups. The conference’s goal is to strengthen mentoring relationships, build firm foundations for successful student experiences, and provide learning and networking opportunities on other topics related to diversity in physics graduate and undergraduate education.